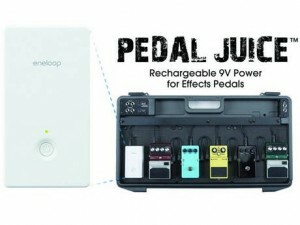 We tend not to have that many gear reviews on Shredaholic, which is a great shame, so I’m really pleased to have had the opportunity to try out the eneloop / Sanyo ‘Pedal Juice’ this month. The basic premise behind the Pedal Juice is that it provides a regulated 9v power supply to your effects pedals, yet unlike a normal 9v battery, its the same shape as an actual effects pedal, so will fit nicely on your pedalboard assembly (or bedroom floor!). The unit has two 9v outputs already supplied to connect to your units, and will support more via daisy-chain adapters. 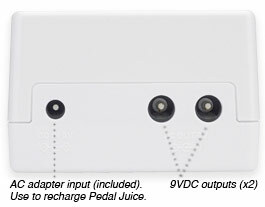 Form and function of the Pedal Juice is excellent; it feels high quality and stylish, and wouldn’t look out of place at all in an Apple store. It’s pretty damn robust, and is also water and shock resistant. As the moulding of the unit is that thick, I’m not surprised. Although the unit is pedal-sized, it’s quite light and comes in at less weight than my metal effects pedals. Also included is a nice zip-up carrying case for keeping the Pedal Juice and associated cabling inside. One charge from the supplied mains plug (100-240v which means it’ll work abroad!) 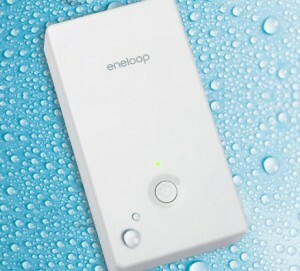 is advertised as recharging fully in 3.5 hours and lasting for up to 50 hours (depending on current draw). The latter figure seems about right from my testing with analog pedals, but the former figure was actually exceeded, as the unit managed to charge up completely in less time. For those of you who use pedal boards with AC transformers on, you may be wondering why this unit would be worth buying. The answer is tone – the Pedal Juice avoids ground loops and other noise interference that can be caused by plugging into mains power lines. Venues that play music aren’t exactly well known for their quality mains wiring, and in the studio hum would be the last thing you need. Charge levels are indicated by an LED on the front of the unit, which also serves to tell you it’s on. The LED will change colour depending on how much charge is left, which is a really nice touch and extremely useful. It might seem trivial now, but what happens when you’re at a gig and you don’t know how much charge is left in your pedal’s batteries? As you might have already figured out, the fact that this unit puts out 9v via a standard sized jack means you can use it for a lot of electronic equipment. Aside from effects pedals, multi-effects units and portable recording devices, you could even find things around the house to power with it. I recently acquired a light box that illuminates photographic slides, even this could be powered by the Pedal Juice. I’d actually go so far as to say that a well designed portable 9v adapter like this has a huge amount of potential for use outside of the guitar world. To sum up, this is a great piece of kit, and if you take guitar playing seriously and use effects then obtaining one really should be on your agenda. Prices in the UK are currently around £100-130, which may sound a lot of money at first, until you realise what a professional piece of kit this is and just how useful it will be. I have this and use it all the time. It’s great when powers in the back of the house, but you want to be in the front. Or the wall sounds bad. Mine is in constant use. I run my analog gear off one, and the digital off the other. Power last forever and sound quality is so clean with this thing! Thank you for your great review! You pretty much covered everything! The only thing I want to add is to mention the cleverly designed on/off button. That way, you can’t shut off your gear by accident. I think it’s pretty gorgeous in the new color! I’m thinking of buying one of these, but I have a few pedals that need positive center tip power (fulltone ’69 and soul bender). I can’t use these in daisy chains, they need to be on an isolated circuit. 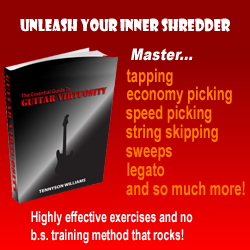 Right now I use a Voodoo Lab Pedal Power, and that works – but man, it would be nice to be able to go wireless for power. Are the two outputs on the Pedal Juice independent and isolated?